I spent months preparing for this day. It’s the Fourth Sunday of Advent: Love. The sermon I prepared was ready. Rehearsals went well the week before with the choir and praise team, and we selected the songs for praise and worship. I was ready to sing! I prayed and had everyone to pray with me. Everyone seemed ready; but then everything suddenly changed. It’s that unpredicted and unexpected moment when one is taken by surprise and you find yourself questioning what did I do wrong? It’s that time when I wondered and ask myself why I even got out of bed or left the house. This past Sunday was one of those days for me. I am certain that I am not alone in this experience. Most pastors and leaders may have had one of those Sundays when he or she is suddenly taken by surprise by unexpected events. It’s when everything you planned for a successful worship service goes wrong. It’s when choir members suddenly disappear and members take Sunday off to shop for Christmas. Or, “There was a cow on the freeway that stopped traffic, Pastor, so I couldn’t make it to church.” And let me not forget my favorite of all: “I don’t go to church on Christmas Day because of the crowds. I can worship at home.” What better way to share your faith and send a corporate message to the world than to be among the body of Christ in Spirit-filled worship and to bathe in His presence? I was ready and prepared all week long to deliver what I felt was a powerful sermon to celebrate the birth of Jesus on the Fourth Sunday of Advent. Just before I left home to attend morning worship I got down on my knees along side of my bed to pray and have a personal time of devotion. I asked God for a Christmas miracle, for souls to be saved, financial blessings, good attendance, and divine healing for the sick. Past Christmases on record have shown that on the Sunday prior to Christmas is one of our biggest and most successful days. This year however the very things I prayed for didn’t happen the way I had anticipated. They seemed to be the exact opposite. Attendance was down, as was giving. Prayer requests for families that lost loved ones during the holidays were in abundance. No decisions were made to become disciples for Christ, which was a great disappointment (however I do believe seeds were planted). To top it all Satan showed up in an attempt to dismantle the entire service—but failed. “Okay, Jesus. What’s up with this?” I asked myself. By comparison I thought it was one of the most difficult Sunday’s I’d experience in a long while. What I quickly learned after morning worship was my expectations were flawed. God had another purpose in mind: to test my faith in Him. Over and over members and friends approached me after service and thanked me for the sermon and were excited about being in the house of God. They witnessed to how much the service meant to them and blessed them. While I was busy looking at those external things God was working in the lives of people internally. My experience was not necessarily what others had experienced or received. There was a heightened sense of God’s presence and an awareness that He was about to do something great for our church. While I tried to figure out what “I” did wrong, the Holy Spirit gave me an inner revelation: My problem was I didn’t realize that as the evidence of God’s presence in my life increased, the need for more evidence ought to decrease. But then as I look at my life and see what God has brought me through, why am I still demanding the same level of documentation from God as I used to demand? God has done more for me than ever, and I already have a diary of God’s deliverances. I can look back at my notes of how many times God has brought me through and give Him praise. Pastors many times are so busy looking at numbers and counting that we forget that God does not see the way we see things. His ways are not our ways. The truth is we experienced a great and powerful service that day. Unfortunately, I was viewing things through eyes of the flesh. I am convinced today that God is calling His church to a higher place of worship. It is a place of relationship and intimacy with God. The problem with some of us is that we come to church every Sunday and engage in everything that leads to intimacy, but we’ve never become intimate. 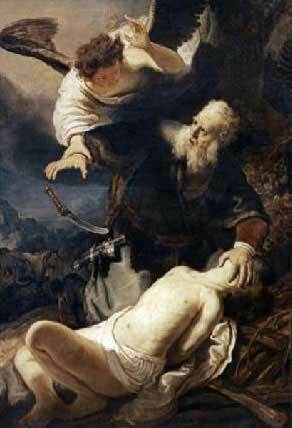 But before we can climb up to Moriah we must first obey His voice and be willing to offer up the “Isaacs” in our lives; the very thing we love most. The first is that we’ll be called to a new place in Him. The Lord said, “Go to Moriah, to the place where I will show you.” God calls us to a new place in following Him, by responding to His call to worship Him in a way we’ve never learned before. Secondly, we are called to surrender to God’s claims. The Lord said, “Sacrifice your only son.” Just as Isaac was the product of Abraham’s and Sarah’s bodies, there are things in our lives that are our “children,” our “Isaacs.” Perhaps it’s a project or goal you wish to accomplish. It may be your actual children, or dreams you have for them. In may be your job, money, material possessions, or famous people. It may be an inspiration for your future. Many times the Lord will ask us to surrender those things that are at the heart of our ambitions and dreams. As we come in worship we also find God’s nature revealed in fresh new ways. God calls us to worship, not to exploit us, but to expose our fears and remove them. And then, as we answer that call, we are introduced to the discovery of the God who is our “exceeding great reward.” And that’s why we’re called to walk in the steps of Abraham and offer up our Isaac. Here’s what I learned through my little test: God still works miracles. When I begin to see circumstances through spiritual eyes and not earthly sightedness, although I may be going through a bad situation, I can still rejoice because the Spirit says, “Keep looking at God.” The Spirit can see God moving and working and changing things.